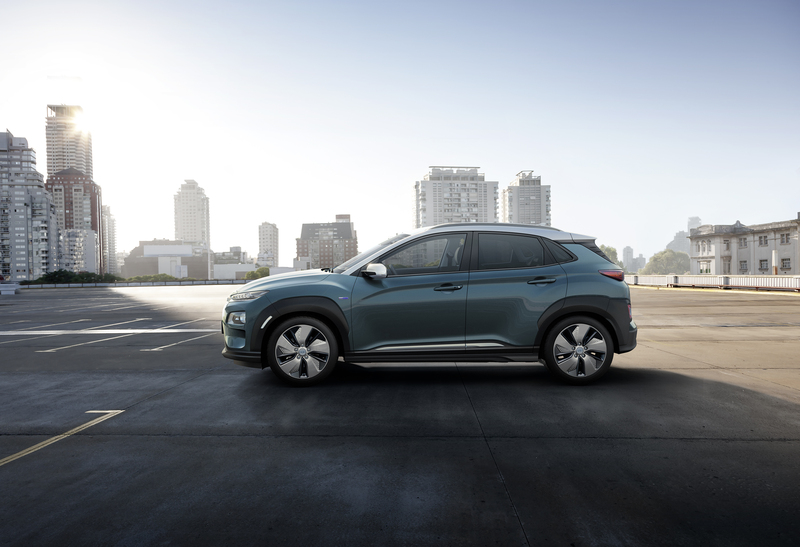 Already at the Geneva Motor Show Hyundai introduced the new electric version of their Kona, the Kona Electric. 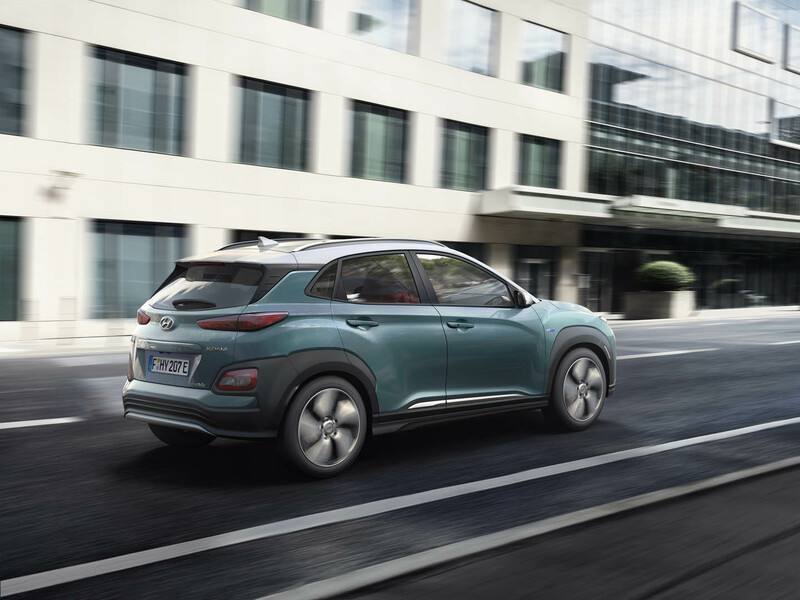 We went to a presentation by Hyundai Netherlands where we could find out more about the strategy behind Hyundai’s zero emission policies, what they expect in the near and further future and how this Kona as well as the Hyundai Nexo Fuel Cell fit in this all. 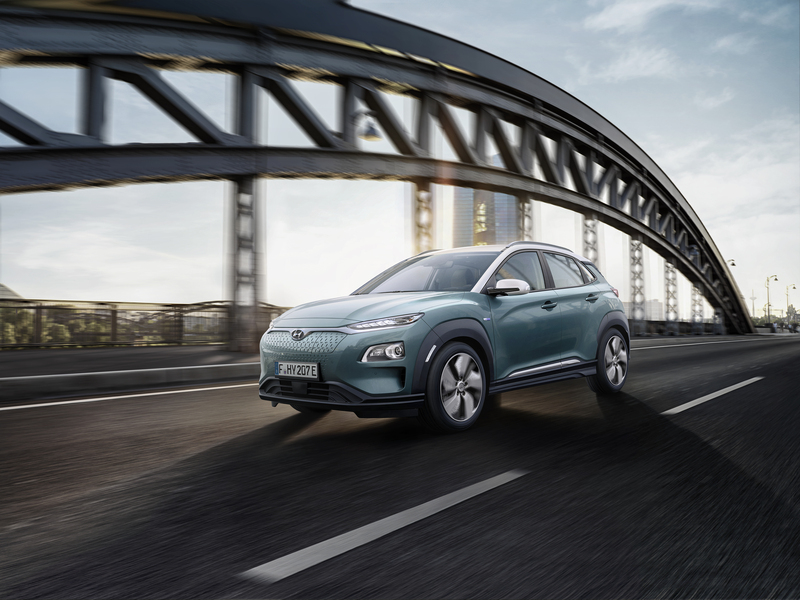 The All-New Kona Electric enables customers to combine the two fastest growing automotive trends – electrification and SUV style. It carries the same expressive design and ‘go-anywhere’ attitude of the regular Kona. The fully-electric version reflects the individual lifestyle of modern customers who, benefit from great fun-to-drive and the low environmental impact of a fully-electric car. The completely new platform of the Kona enables a space-saving integration of the battery packs without compromising the roominess. The All-New Kona Electric features two different powertrain versions, offering customers one of the most powerful electric motors. The long-range battery version provides driving range of 482 kilometres*, delivering a maximum output of 204 PS (150 kW). With a battery capacity of 39.2 kWh, the basic version drives 312km* on a single charge with the motor delivering 136PS (100 kW). 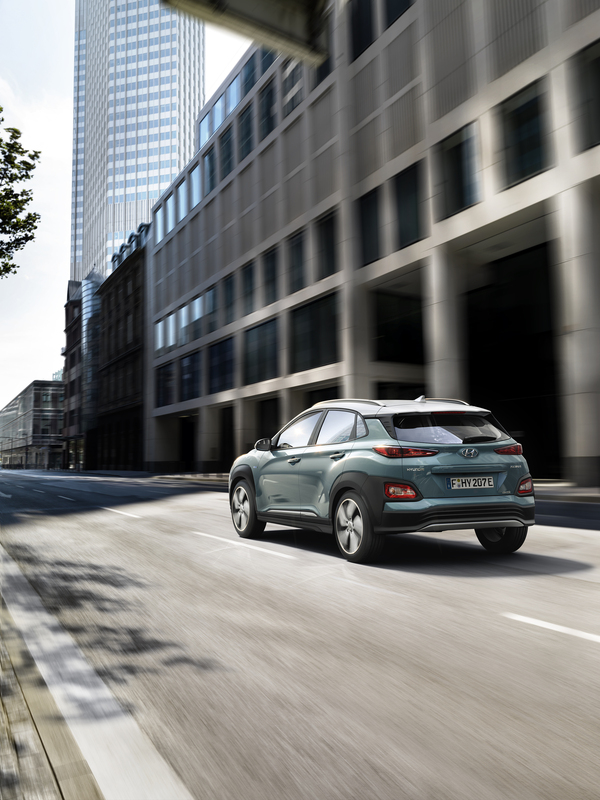 With 395 Nm of immediate torque and an acceleration of 7.6 seconds from 0 to 100 km/h, the All-New Kona Electric provides a real fun-to-drive experience. 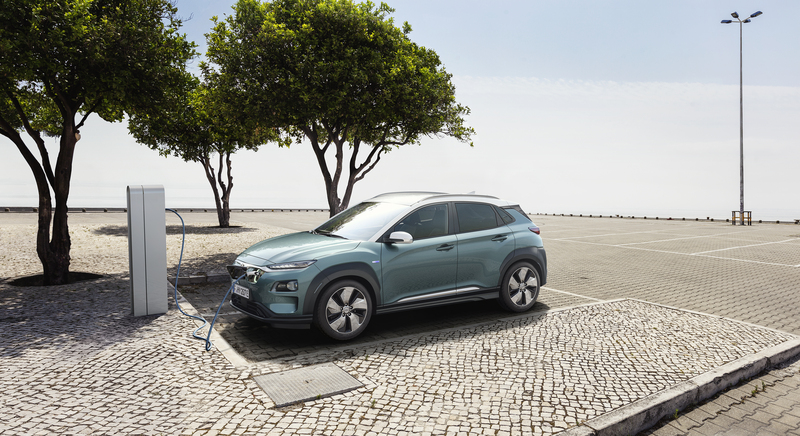 A special feature of the All-New Kona Electric is the shift-by-wire operation module which enables an intuitive operation of the electric powertrain. The adjustable regenerative braking system allows the driver to adjust the intensity of the regenerative braking by using the paddle shifts behind the steering wheel. The system recuperates additional energy when possible. Drivers also benefit from the large seven-inch supervision cluster, which displays key information about the car’s driving performance and, in addition, the combiner head-up display shows relevant driving information directly to the driver’s line of sight. The new high-resolution seven-inch supervision cluster displays the different gauges, such as the speedometer, battery charge level, energy flow and driving mode to the driver. Depending on the selected drive mode, background colour and gauges are adapted to always provide the most important and useful information. In addition, the combiner head-up display (HUD) projects the relevant driving information directly to the driver’s line of sight. This allows faster processing of information while keeping attention on the road ahead. With a projected image size of eight inches at two metres distance and a luminance of more than 10,000 candela per square metre, the new head-up display guarantees optimal visibility in different light conditions. The angle and height of the head-up display can be adjusted to ensure ideal visibility for individual needs. Once activated via the button beside the steering wheel, the combiner deploys vertically and disappears into the dashboard when not in use. While driving, the head-up display supports save driving by displaying information, such as speed, navigation commands and the fuel level as well as safety-related warnings from assistance systems, such as the Forward Collision-Avoidance Assist, Lane Keeping Assist, Blind Spot Collision Warning, Intelligent Speed Limit Warning and Driver Attention Warning. Information about the audio mode and radio are also projected. Plenty of space is offered to both passengers and luggage. 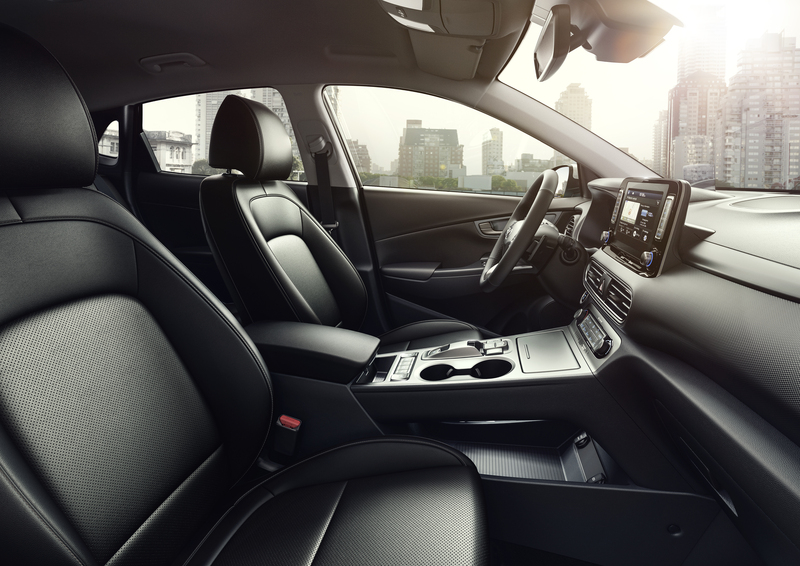 The legroom in the first row is 1,054 mm, while passengers in the back seat benefit from 848 mm of legroom. The headroom accounts for 1,006 mm in the front and 957 mm in the rear. Luggage space totalling 332 l (1.114 l max. ), offers generous roominess, making it suitable for everyday needs. The All-New Electric offers pure e-mobility with two different powertrains. The long-range version with the 64 kWh battery provides an electric range of 482 km and an energy consumption of 14.3 kWh/100 km (under WLTP regulations). 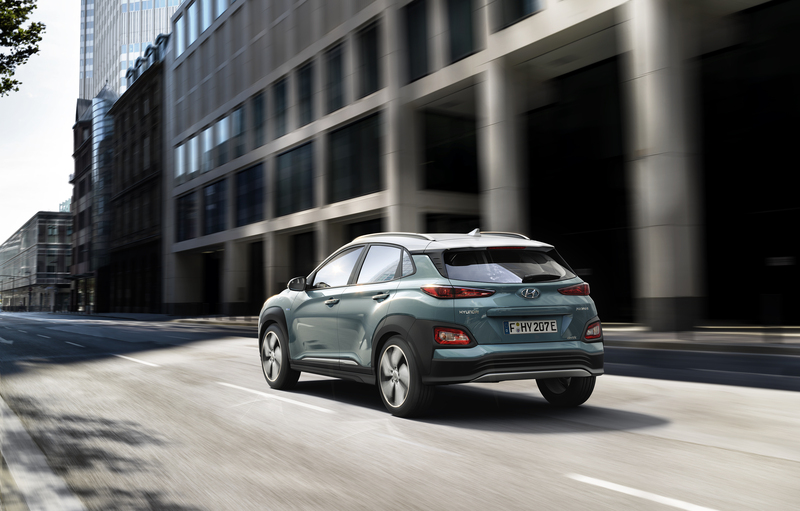 The electric motor delivers an output of 150 kW, accelerating the All-New Kona Electric to 100 kph in impressive 7.6 seconds. With a battery capacity of 39.2 kWh, the basic version drives you 312 km on a single charge with the motor delivering 100 kW and an energy consumption as low as 13.9 kWh/100 km (under WLTP regulations). Both powertrain versions deliver 395 Nm of immediate torque, offering the driver of Kona Electric great fun-to-drive, having the full power available from the first second, providing a maximum speed of 167 km/h for the long-range battery, and 155 km/h for the short-range battery. The shift-by-wire system enables operation of the car simply by pressing buttons to switch driving modes. It also eliminates the routing space required for housing the mechanical linkages between a normal shifter and the transmission, providing additional storage space in the front of the car. 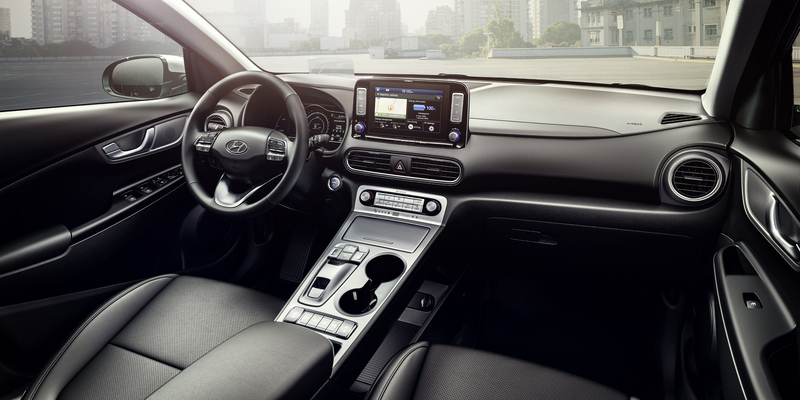 The fully-electric subcompact SUV made by Hyundai also features an electronic parking brake (EPB) at the command of the driver’s fingertips. Charging the lithium-ion polymer battery up to 80% only takes about 54 minutes using a 100 kW direct current (DC) fast charger. With the 7.2 kW on-board-charger, charging with alternating current (AC) takes 9 hours 35 minutes for the long-range battery pack and 6 hours 10 minutes for the shorter-range battery pack. Drivers also have the option of charging their car at a compatible regular household power socket using the ICCB-cable (in-cable control box). The charging port is located in the vehicle’s front next to the Hyundai logo. To suit customer’s varied lifestyles, the All-New Kona Electric contains advanced connectivity and navigation features. To enhance seamless integration of the driver’s smartphone, making operation more intuitive and safe while driving, the car is equipped with the Display Audio system, which is available with Apple CarPlay, Android Auto and Bluetooth connectivity. This way, users can control their music, telephone or navigation functions on the seven-inch capacitive colour LCD touchscreen, while remaining focused on the road. The Display Audio system also includes a rear-view camera with dynamic guidelines. 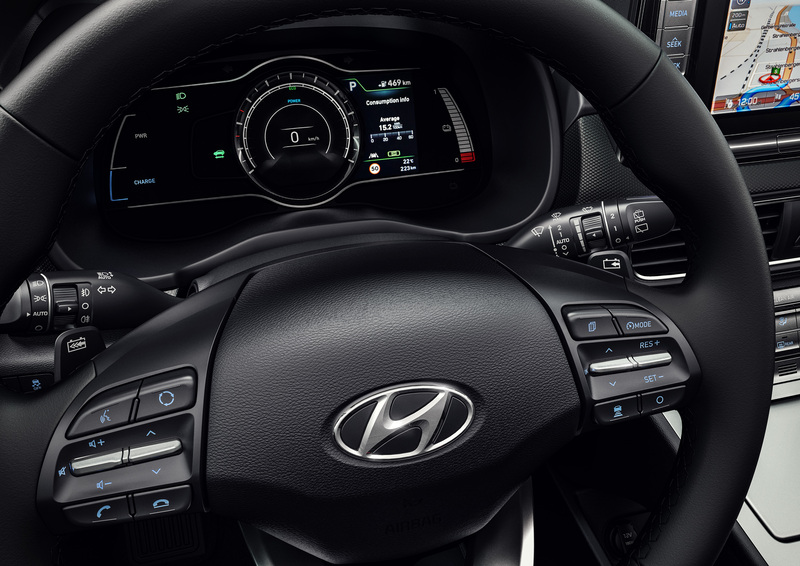 Additionally, the seven-inch information screen is located in the centre of the instrument cluster between the two dials – a standard for Kona Electric. Customers also have the option to choose the eight-inch navigation system, offering the same connectivity features with Apple CarPlay, Android Auto and Bluetooth. In addition, it includes a free seven-year subscription to LIVE services, offering updated information in real time about weather, traffic and speed cameras (where legally allowed), plus online searches for points of interest. The navigation system also features 3D maps and Hyundai’s unique Lifetime MapcareTM** with free annual map and software updates included. To enhance vehicle operation, the system includes a rear-view camera with dynamic guidelines.